I’ve been meaning to do an announcement about this year’s convention appearances, and once again time has gotten away from me. 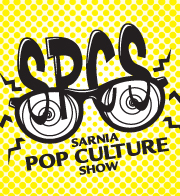 The Sarnia Pop Culture Show is nearly upon us! This Sunday, February 24, 2013, 10 AM – 6PM at the Holiday Inn, Sarnia (1498 Venetian Blvd, Point Edward, Ontario). This is an extra-exciting show for a couple of reasons. The first being that it’s sponsored by Future Pastimes, my home-shop for comics, (followed closely by The Silver Snail), it’s organised by some good friends of mine who have been working their butts off to make it great, it’s my first show of the year, and lastly, it’s the first event of it’s kind in Sarnia! So, I’ll be there with yoga prints and signing and sketching-up copies of Starting Tomorrow. If you’re planning on attending and wanted a special commission, print or piece of original artwork, drop me an email and I’ll do my best to have it ready for you at the show. I still have a bit of planning to do, but so far, I’m also exhibiting at Toronto Comicon in March and Vancouver Fan Expo in April. In May, I will be making my first appearance at TCAF where the new Promises Promises collection, Starting Monday will debut! I’m at a bit of a loss for words to describe how excited I am about that. TCAF is an amazing show and (obviously), I’m looking forward to showing off the new book. It won’t be available in the Promises Shop until Monday, May 13th, so I hope to see you there!